Christmas is a time for football, and there is a glorious amount of action live on Sky Sports over the festive period. Every Sky Bet Championship team has six games to play between now and January 1 and, at such an unpredictable time of year, we have turned to Football Manager to get some answers. So who is going to rise? And who is going to fall? Football Manager have used their unique software to simulate every game over the festive season to see how it will shape up compared to the current table above. Football Manager have predicted that Leeds will usurp Norwich at the top of the table by the end of the festive season, although the Canaries won't fall far and they will sit in second. The only defeat Leeds are set to suffer will be against Aston Villa, where Tammy Abraham will grab the winner after 74 minutes in a 3-2 win. Norwich's only defeat, meanwhile, will come in a shock result at Bolton as they are beaten 1-0. 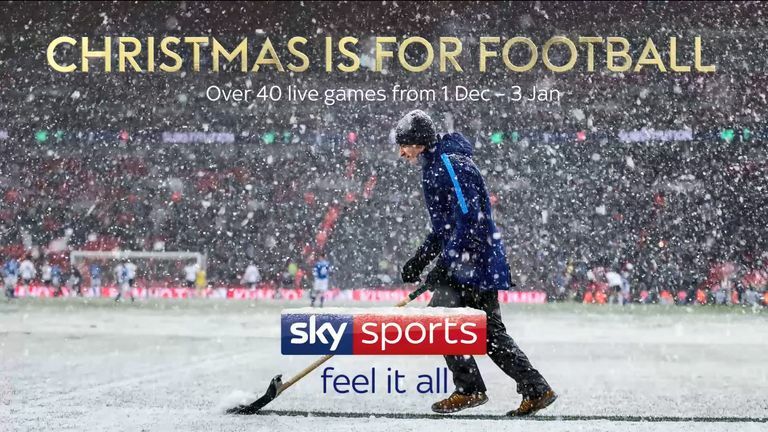 Sky Sports will be showing 40 live games from December 1st to January 3rd! Stoke, meanwhile, will prove to be the form team as they stay unbeaten and get themselves up into the play-off places. They will be joined there by West Brom, Sheffield United and Middlesbrough. Ipswich have only won once this season, but Football Manager believe that will become three soon enough as they beat Wigan 2-0 and Millwall 2-1. It won't be enough, however, to lift them from the foot of the table. They will be joined in the relegation zone by Hull and Millwall, neither of whom will win a single match. Billy Sharp and Jay Rodriguez will be the two top scorers during the period, with both netting three goals apiece for Sheffield United and West Brom respectively. Dwight Gayle gives the Baggies bragging rights in the local derby with a 35th-minute winner. The East Midlands Derby ends in a draw after Jack Marriott's 81st-minute strike cancels out Lewis Grabban's opener. Tammy Abraham's winner consigns Leeds to their only defeat of the festive period after they had taken an early lead through Mateusz Klich. Kemar Roofe's 70th minute strike completes Leeds' comeback after they had fallen behind to Ben Osborn's 21st-minute goal before Patrick Bamford restored parity after 53 minutes.